BLOUNTVILLE — Two championship athletic teams and several student artists received accolades during the Sullivan County Board of Education’s regular meeting Dec. 4. The school system honored the Mary Hughes Lady Lions volleyball team, the Holston Middle Eagles football team and eight students whose work was chosen in the annual Christmas card art contest. Elementary: Holston fourth-grader Jax Brown, teacher Natasha Conner; Miller Perry third-grader Campbell Skinner, teacher Abigail Williams; and Bluff City second-grader Canon Slagle, teacher Lee Dixon. Middle: Mary Hughes sixth-grader Kyndl Hodge, teacher Kris Hagy; Holston Valley eighth-grader Konner Mercer, teacher Vicki McGlothlin; and Blountville seventh-grader Tamia Fletcher, teachers Amy Nichols and Donna Hatcher. High: Sullivan East senior Tyler Smith, teacher Debra Brooks; and Sullivan South sophomore Becky Bernard, teacher Holly Czoka. In a presentation by Wendell Smith, supervisor of human resources, the BOE learned that the Lady Lions have been Tennessee Middle School Athletic Association state sectional champions over the past three years, as well as three-time TMSAA Area 1 champions and two-time Big 3 Conference and tournament champions, East Tennessee State University preseason tournament Gold Division champions, Sullivan East High Patriot Palooza champions and Rocky Top Classic Gold Division runner-up. Eighth grade members are Peyton Abernathy, Christa Fortner, Jenna Hare*, Loren Hensley, Hannah Hodge*, Chloe Lacey*, Evie Leonard, Deserae McClellan, Janae Moultrie* and McKensi Reese*. Seventh grade members are Carly Bradford, Olivia Eaton and Kylie Hurley. Sixth grade members are Kaitlynn Gragg, Kyndl Hodge and Willow McClellan. Kevin Smith is head coach and Kendall Ivester is assistant coach. Also in a presentation by Smith, the BOE learned that the Eagles won the Big 3 Conference championship and had a 10-0 record for the year. The team also was the Area I AA state sectional champions. Its average margin of victory was 41-10, and the Eagles offense averaged 342 yards per game. The defense set a school record with 26 takeaways. Eighth grade halfback and linebacker Roy Moody set a school rushing record of 1,575 yards for the season, as well as a rushing touchdowns record of 28 and 69 tackles. Eighth grade quarterback and safety Luke Jenkins passed for 922 yards, completed 53 of 81 pass attempts, made 17 passing touchdowns, a school record, and had no interceptions. In addition to Moody and Jenkins, eighth grade members are Jake Davenport, Elijah Hall, Sam Harmon, Micah Turner, Carson Tate, Dale Bryant, Logan Pearce, Isaiah Kerr, Jordan Hart, Dan Hunt, Noah Hale and Jeremiah Kirkpatrick. 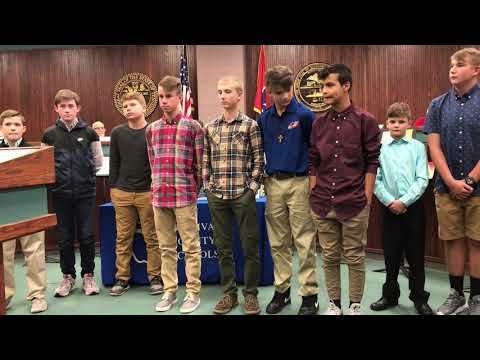 Seventh grade members are Bryson Horne, Ethan Branch, Cameron Baker, Dawson Tuell, Jackson Pickens, Javen Tanner, Carter Sanders, Keenan Taylor and Trey West. Sixth grade members are Trent Moody, Cayden Coates, Tristen Denny, Wyatt Cochran and Bryce Harrison.